by various sources. December 01, 2011. ZAKHO, Bet-Nahren Assyria (Northern Iraq) — Zakho, meaning victory in the Aramaic language, is the ancestral homeland of the Assyrians. Security officers in the Dohuk Governate, which includes Zahko, said that "dozens of young men" targeted Christian-owned businesses and attacked at least 15 liquor stores, two massage parlors and two hotels after being incited by Islamic noon prayers on Friday, December 01, 2011. 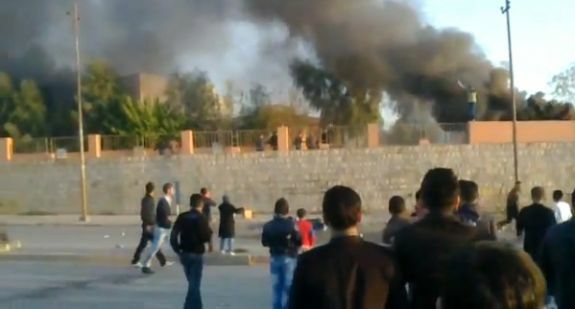 A still image from video of a riot in northern Iraq. by Committee for Accuracy in Middle East Reporting in America (CAMERA). December 05, 2011. The Kurds are often portrayed as the "Good Guys" of Middle Eastern politics. Having endured oppression and violence at the hands of ethnic majorities in Iran, Iraq, Syria and Turkey, the Kurds have a story of cultural survival to tell. At least 25 people were wounded in northern Iraq in alleged "acts of sabotage" carried out by men who had been "instigated" by Muslim clerics, a Kurdish leader and local security officers said. The incident occurred Friday afternoon in Zakho, which is in Iraq's Kurdistan region near the Turkish border and about 540 kilometers (335 miles) north of Baghdad. Security officers in the Dohuk Governate, which includes Zahko, said that "dozens of young men" attacked at least 15 liquor stores, two massage parlors and two hotels after Friday noon prayers. At about four minutes into this video, a crowd of young men can be seen thrashing a storefront. Young men can be heard changing Allahu Akbar! Other young men are seen recording the event with their video cameras. At about 5 minutes, 30 seconds into this video, fire can be seen. Thousands of Kurdish Muslim men took to the streets after a Fatwa (religious decree) was issued by a Muslim cleric at a Friday prayer. The Fatwa ordered the Islamists to assault those who violate the Sharia Law. Numerous Christian businesses were destroyed by fire as the criminals stood by watching, congratulating one another for their supposed victory. Video shot by bystanders show men chanting Alah-O-Akbar (God is Great) as they approached Christian stores. This is not the first attack on Christians by their Kurdish neighbors. In 2005 a researcher compiled a list of anti-Christian attacks associated with the rise of Kurdish power in Iraq. The list can be found here. by Mohammed Tawfeeq, CNN, December 03, 2011. The officers claimed that clerics "instigated" the action. So, too, did Massoud Barzani -- the president of the Iraq's Kurdistan autonomous region -- who blamed "men who were instigated by some clerics to carry out acts of sabotage." The Kurdish leader said, in his statement Saturday, that the attackers targeted "a number of tourist facilities, especially facilities owned by ... Christians and Yazidis." Religious minorities, such as Christians and Yazidis, make up less than 5% of Iraq's population, according to the Office of the U.N. High Commissioner for Refugees. Since 2003, attacks against these minorities by insurgents and religious extremists have driven more than half of these minorities out of the country, according to U.N. statistics. Barzani said that, regretfully, "in response to these riotous actions, ... a group of people attacked a number of headquarters of the (Kurdistan) Islamic Union," a prominent political party. Authorities "made a major effort" to prevent the "acts of sabotage, but they could not," the Kurdish leader said. Several police were among those wounded, according to security officers. "I denounce these inhumane and illegal acts, and I call on the people of Kurdistan to respect the national, religious and sectarian coexistence and take it as a basic goal for them to live together peacefully," Barzani said. A special committee has been formed to investigate the incident "and take legal action" against those involved, the Kurdish leader added. by Judson Berger. FoxNews.com, December 09, 2011. A rash of attacks on Christian-owned businesses in northern Iraq has raised troubling questions about the future safety of the country's shrinking Christian community, particularly as U.S. forces withdraw completely from the nation they've refereed since 2003. Younadam Kanna, a Christian member of the Iraqi parliament and secretary-general of the Assyrian Democratic Movement, confirmed to FoxNews.com that dozens of shops -- many Christian owned -- were attacked across multiple cities. "The extremists prepared themselves to attack on more locations ... but they were prevented by local police and security in addition to some guards from the villages," Kanna said in an email. The incident underscored the perilous circumstance the country's dwindling Christian population finds itself in, as U.S. forces withdraw and the surrounding region takes what could be an Islamist turn, if early results in the Egypt elections are any gauge. "The Iraqi Christians ... are living in fear," said U.S. Rep. Frank Wolf, R-Va., who is pushing for the creation of a special religious freedom envoy in the region. "Now with the forces leaving ... I think the Iraqi Christians are going to go through a very, very difficult time." Urging the U.S. government to do more to draw attention to security concerns, Wolf said he "would not be surprised" if Iraqi Christians continue to face these kinds of threats. The latest attacks began in the northern city of Zakho, and spread to several other cities. According to local media in northern Iraq, the attacks began after a sermon Friday by Mala Ismail Osman Sindi, who reportedly railed against massage parlors in the community. A Muslim mob subsequently tore through the streets to destroy not only a massage parlor but more than two-dozen other businesses. The mullah later denied responsibility for inciting violence in an interview with the Iraqi newspaper Rudaw. Kanna catalogued the damages. He told FoxNews.com that in Zakho alone, 16 liquor stores were attacked, 13 of them Christian owned and the rest owned by members of the Kurdish Yazidi community. The attackers also targeted Yazidi-owned hotels, 11 Christian-owned hair salons, and the massage shop -- which according to Kanna is owned by a Muslim man. According to the news site Ankawa.com, business owners later received death threats in the event they reopened. Kanna expressed hope that law enforcement would investigate the crimes. Local officials are now calling for calm. But David William Lazar, chairman of the American Mesopotamian Organization, suggested the mob attacks were not as spontaneous as they appeared. "The mobs were carrying pictures and signs, and they knew exactly where to go," he said. Lazar said the sectarian tensions surely will not dissipate as U.S. forces head home. "It's a big mess," he said. Asked who would be around to ensure security for the Christian population, he said: "Basically, no one." He said Assyrian Christians and other groups are looking to form their own province, which could then stand up a police force -- but that would only cover the province's territory. He noted that the Assyrian Democratic Movement was among the first to disarm after the U.S. invasion. The Iraqi Christian community has endured a wave of persecution during the Iraq war. According to the American Mesopotamian Organization and the Iraqi Christian Relief Council, the population has dropped from 1.4 million before 2003 to about 600,000. Juliana Taimoorazy, founder of the Iraqi Christian Relief Council, said the Christians -- who over the past decade have fled to surrounding countries to escape the violence -- are faced with limited options today. She said they simply can't go to Iran, can't handle more refugees and Syria is no longer safe. "They don't know what tomorrow or the next day will bring, but really there's nowhere else to go," she said. She questioned the security for Christians in northern Iraq, claiming the Kurdish regional government there did not initially intervene to stop the recent violence. She also said it's "disturbing" the U.S. government has not spoken up on the latest attacks. "We're on the verge of extinction," she said. Taimoorazy said the weekend attacks did not result in any deaths to her knowledge. Many of the businesses were closed at the time, but she said the attacks caused millions of dollars in damage to the destroyed properties. The violence follows a deadly attack in Baghdad in October 2010, when dozens of Iraqi Christians were killed in an attack on a church. A State Department official told FoxNews.com on Friday that in light of the recent riots, community leaders in Iraq must "reject such tactics, which only lead to division and violence." "These riots were incited by hateful and intolerant rhetoric that is harmful to the interests of all Iraqis," the official said, adding that U.S. officials maintain "regular contact" with local officials in the region. The official noted that the Kurdistan Regional Government took "swift action" to combat the riots last Friday and condemned the attacks. The official said offices of the Kurdistan Islamic Union Party were also attacked. Wolf praised the American Embassy team in Iraq and said they are well aware of the threats Iraqi Christians face. He urged the Obama administration to do more to speak up on the issue. "They know this is a problem," he told FoxNews.com. "Our government ought to be advocating and ought to be pushing." 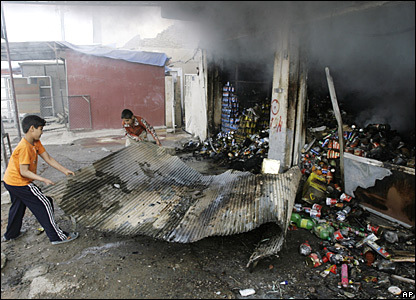 A scene from Zakho's Friday riots in northern Iraq. Photo: Rudaw. by Hevidar Ahmed and Ahmed Iminki. Rudaw, December 12, 2011. ZAKHO, Iraqi Kurdistan — The preacher blamed for inciting widespread riots last week in Dohuk province has denied accusations that he provoked his followers into destroying businesses deemed un-Islamic. Following Mala Ismail Osman Sindi’s Friday sermon in which he claimed prostitution was occurring in massage parlors in the Kurdish border town of Zakho, a group of young men set alight the town’s only massage parlor, a dozen liquor stores and three hotels. Many of the businesses were owned by minority Christian Assyrians and Yezidis. The violence later spread to the city of Dohuk and Sumel, where rioters torched the offices of the Kurdistan Islamic Union, ransacked. Sindi confirmed that someone indeed stood up and encouraged people to burn the massage parlors. Samyan Abdulkhaliq, director of the office of religious affairs in Zakho, told Rudaw that they will investigate Sindi. “We’ll investigate and if we find out that that mullah did indeed encourage people to be disruptive, we will take our own measures with him even before the courts take the case,” he said. According to Ismail Mustafa Rashid, the mayor of the town of Sumel, four liquor stores were burnt in their town. 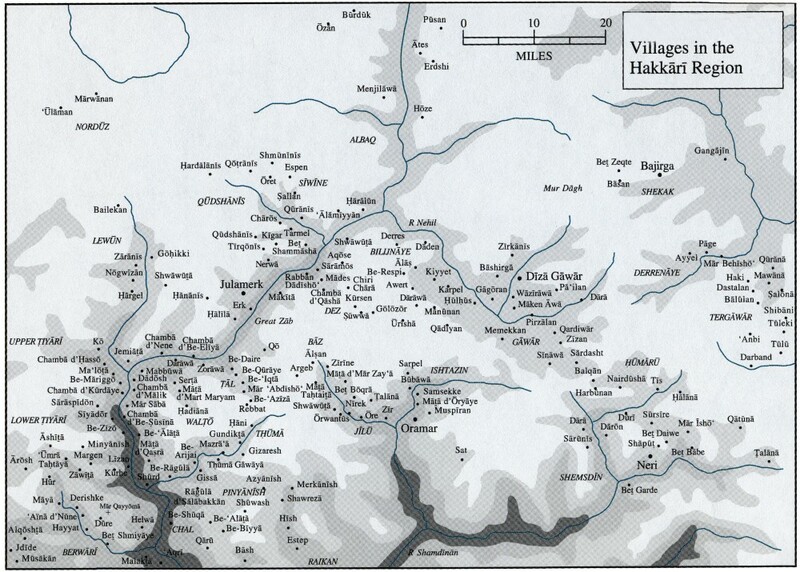 Zakho is located on Iraqi Kurdistan’s border with Turkey. It is about 300 miles north of Baghdad and less than 10 kilometers from Turkey, and is considered one of the most important trade gateways of Iraq. Zakho is an ethnically and religiously diverse town where Kurds, Assyrian Christians, Yazidis, Armenians and some Arab families live side by side. According to eyewitnesses, some rioters tried to attack the Christian quarter of town on Friday, but the guards of political party offices opened fire above people’s heads and stopped them from reaching the neighborhood. 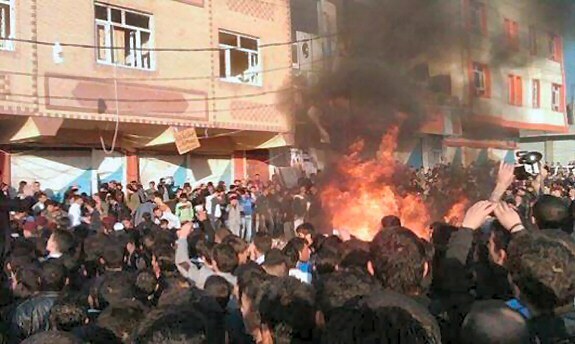 Later on Friday, a group of people torched an Islamic Union office in Zakho. Later the Islamic Union’s offices were stormed in Duhok, Sumel and Kasrok. Ghazi Saeed, the head of the Islamic Union’s branch in Dohuk, estimated the damage was about US$10 million. Following last week’s unrest, the Islamic Union and the Kurdistan Democratic Party (KDP), which controls Dohuk province, exchanged sharp words and accusations. The KDP held the Islamic Union responsible for causing the violence and the Islamic Union said the people who attacked its offices were members of the KDP. KDP’s Abu Zerro said that Saeed made the situation worse by talking to the media and saying that his office was under threat before anything had happened. Ashti Kochar, Dohuk’s security chief, told Rudaw that the Islamic Union seemed to have braced itself for the attacks at least a week in advance. Abdulwahid Taha, an anchor at the Islamic Union’s local TV channel in Zakho, said the channel had aired a program the night before the attacks where viewers called in and expressed their anger against the city’s liquor stores and massage parlors. “On the day of the attacks, the Islamic Union’s main office was completely evacuated hours before the mob reached them,” Taha said. In a press conference on Saturday, Salahaddin Bahaddin, secretary-general of the Islamic Union, held the KDP responsible for the attacks on his party’s offices. On Friday, the KDP condemned the violent acts in an official statement. The KDP also rejected the claims of the Islamic Union accusing the KDP of inciting people to storm their offices. Ibrahim said he doesn’t think one mullah alone could incite that much violence. But the Islamic Union denied any connections to the violence. On Saturday, Kurdistan Region President Massoud Barzani released a statement in which he condemned the incidents of Zakho. Barzani said instability in the Kurdistan region is unacceptable and that a special committee will investigate Friday’s incidents and bring the perpetrators to justice. by Aswat Al-Iraq.info. December 05, 2011. ARBIL / Aswat al-Iraq: A leader at the Assyrian Democratic Movement described the recent violent events in Duhuk province as "negative indicator for the Christian presence in the province". 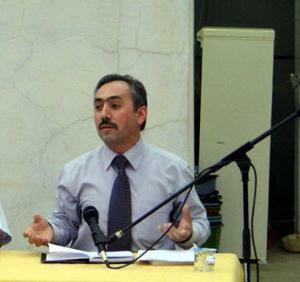 Michael Benyamin of Zaho Assyrian Democratic Movement pointed that that "these actions will negatively affect the democratic process in Kurdistan", pointing that "the Christians are changing views thatKurdistanis a safe haven for them". He expressed astonishment on the security forces stands on the even where "they became just spectators, which matter needs governmental answers". Kurdistan President Masoud Barzani stressed, from Zakho town, the necessity to preserve the dominance of law, pointing that the investigations are going on in the last 2-day events. In a speech before Zakho citizens, he confirmed that "no one or part is permitted to incite the people to commit violent actions inKurdistan". President Barzani, who arrived in Zakho this morning, confirmed that the investigations are underway. Sources in the town said that the visit was expected to counter the tense situation there, following last Friday action to burn beverages stores and the Islamic Party headquarters. Three hotels, Chinese spa and more than ten stores were burnt by hundreds of protestors who claimed that these places undertake illegal and immoral activities. The riots moved to Duhuk city where some tourist casinos were burnt. Security forces were scattered all over the province. These attacks stirred certain fears among the Christians and Izidis who trade in such works and commodities. In a YouTube video images of the assault that took place yesterday in Iraqi Kurdistan, a few kilometres from the border with Turkey. The violence started after Friday prayers triggered by imam’s sermon. Christian personalities: since the Arab Spring, radical Islam is "more dangerous". Baghdad (AsiaNews) - A group of protesters linked to the Islamic extremist wing, composed mostly of young people, yesterday stormed several Christian-owned shops, a hotel and a beauty parlour. The violence erupted yesterday afternoon in the town of Zakho, about 470 km from Baghdad, Iraqi Kurdistan located a few kilometers from the border with Turkey, and caused the wounding of at least 30 people, including 20 policemen. The fundamentalist wrath was unleashed by the vitriolic sermon of an imam in the local mosque, after which punitive raids were launched across the city. Pro-government Kurdish factions have already responded to the onslaught of the xtremist groups, who burned at least six sites of the Islamic Party of Kurdistan in the city and surrounding areas. A video posted on YouTube (click here to view it), shows the assault against Christian shops and properties. Local Christian sources interviewed by AsiaNews - anonymous for security reasons - were involved in the raid confirm that "hundreds of people, especially young people" destroyed "at least 13 liquor shops, but the number could reach 30. Witnesses added that "the police did not react" and it is likely that "the assault was pre-planned." The extremist crowd, that carried out the attack in Zakho, then headed for Sumaili - town 15 km from Dohuk, the third largest Kurdish city - where once again exercises owned by Christians and Yazidis were targeted. In Sumaili, said the source for AsiaNews, there are at least 200 Christian families who are now terrified. The violence continued in the Christian village of Shiuz, where 180 families live, and " the Kurdish police intervened to restore calm only two hours later ". "The extremist crowd - he adds - chanted jihad, or holy war, and anti-Christian slogans." The Christian community in the region experienced a day of panic and terror at the hands of extremists and abandoned by local authorities. "These events - warns the source - lead to the faithful fleeing their native lands. In Mosul, Kirkuk and Baghdad, the police took steps to protect churches and places of worship. " by American Mesopotamian Organization and Iraqi Christian Relief Council. The vulnerable Christian Assyrian nation (also known as Chaldean and Syriac), the indigenous people of the land, have yet again come under fire in Iraq. Thousands of Kurdish Muslim men took to the streets after a Fatwa (religious decree) was issued by a Muslim cleric at a Friday prayer. The Fatwa ordered the Islamists to assault those who violate the Sharia Law. Numerous Christian businesses were destroyed by fire as the criminals stood by watching, congratulating one another for their supposed victory. Video shot by bystanders show men chanting Alah-O- Akbar (God is Great) as they approached Christian stores. These crimes against humanity create a renewed fear in the hearts of a community which has been reduced from 1.4 million prior to 2003 to currently a mere 600,000. We at the American Mesopotamian Organization and the Iraqi Christian Relief Council strongly condemn these heinous acts. The United Nations and human rights organizations throughout the world to stop turning a blind eye on the plight of the Christians in Iraq. The world powers, particularly the United States Government, to break their silence and demand justice for a nation (Assyrian) which has endured numerous loss of lives and property for almost a decade. All American citizens to sign this petition and send a strong message to President Obama and to their State Representatives and demand answers from the State Department in regards to these criminal acts committed against the Assyrian people in Iraq. The US Congress and the Obama Administration to put an indefinite freeze on all funds allotted to the Kurdistan Regional Government until a full investigation has been completed and the perpetrators of these dreadful acts are brought to justice. by Assyrian United Organizations of Illinois. December 14, 2011. As the United States prepares to withdraw its troops from Iraq, a horrible wave of terrorism has swept several towns in the Kurdistan Region. On Friday, December 2, 2011, starting in Zakho, thousands of young men paraded through several areas, destroying, pillaging and burning shops, hotels, and other properties. The attacks spread to 5 other towns and carry the hallmarks of an organized campaign. Their targets were the properties of the indigenous inhabitants of the area; the Chaldean Syriac Assyrians and the Yezidis, who have been the subjects of severe persecution. Shockingly, security forces in the region seemed to be non-existent during critical hours. The Chaldean Syriac Assyrian community of the United States condemns these acts of terrorism as a tactic to intimidate and drive our people out of Iraq, and calls upon the Kurdistan Regional Government to act swiftly and justly to investigate this crime and to punish the instigators and participants. We further call upon the United States government to reevaluate its departure from Iraq, and work with the Iraqi authorities and the United Nations to move toward a viable and lasting solution in the form of the recognition, under the constitution of Iraq, the Province in the Nineveh Plain as a mechanism to protect the safety, property, culture, and identity of our peopleand that of other vulnerable minorities who coexist in the area. For over 8 years, the continued targeting of these minorities in Iraq has resulted in an exodus that has threatened their very existence. The world today cannot and should not allow the destruction of the Chaldean Syriac Assyrian community and other minorities in Iraq. The Iraqi government and Kurdistan Regional Government's lack of sufficient response and meaningful concrete movement toward a solution, along with the insufficient response of the security forces of the KRG to the latest attack, have formed a resolve in our community. A viable and permanent solution - in the form of the Nineveh Plain province must move forward immediately. History must not repeat itself. The Semele massacre of innocent Assyrian women, children, unarmed men, and priests in 1933 lingers in our memories, as does the crime committed against our people at the Our Lady of Salvation Church in Baghdad last year. Those who attacked Semele again, where the bones of our ancestors cry out for justice, must know of our resolve. We stand united in seeking a dignified solution to the plight of minorities in Iraq. We call upon the Iraqi Government and all of its branches to move swiftly and immediately toward the establishment and recognition of the Nineveh Plains Province, to allow the minorities the security and protection under law. We call upon the government of the United States to consider the importance of its role and responsibility, under international law and obligations, in considering its next steps in Iraq. In the very immediate future, the United States has the chance to pass policy language currently adopted by the United State Senate for the 2012 appropriation that will support progress towards the formation of the Nineveh Plain Province. We finally call upon the United Nations, pursuant to the various treaties and charters, to consider the current plight of the Chaldean Syriac Assyrians and the Yezidis, Shabek and Turkmen with utmost concern. by Assyrian Organizations in Armenia and Europe. December 21, 2011. We appeal to you with the request to state your opinion about the persecution of the non-Muslim population – the Assyrians, Armenians and Yezids, on the territory of Iraq since 2003. Another violence has occurred in the north of the country, the so called Kurdistan, on December 2. The disorders and violence lasted 2-3 days. Ethnic cleansing of the non-Muslim population took place with tacit consent of the federal and regional authorities of the country, maybe even with their consent. On Friday, December 2, after the midday prayer, a crowd of militant fanatics attacked the Christian area Al-Nasara in the Zakho city. Kurdish Islamites set fire to bars, wine-alcohol shop, Barber salons, restaurants and Hotels belonging to Christians, mainly to those owned by Assyrian Community. The mass-media informed that the fundamentalist wrath was unleashed by the sermon of one of the radical imams in the local mosque. Initially the crowd consisted of 50 people, but soon hundreds of thugs joined them. The information of the local Assyrian Community representatives about the lost control situation was confirmed by official people, including the head of Kurdish regional autonomy, Mr Massoud Barzani. Unfortunately, the vacuum of safety extended to nearby areas of the Assyrian Christians. 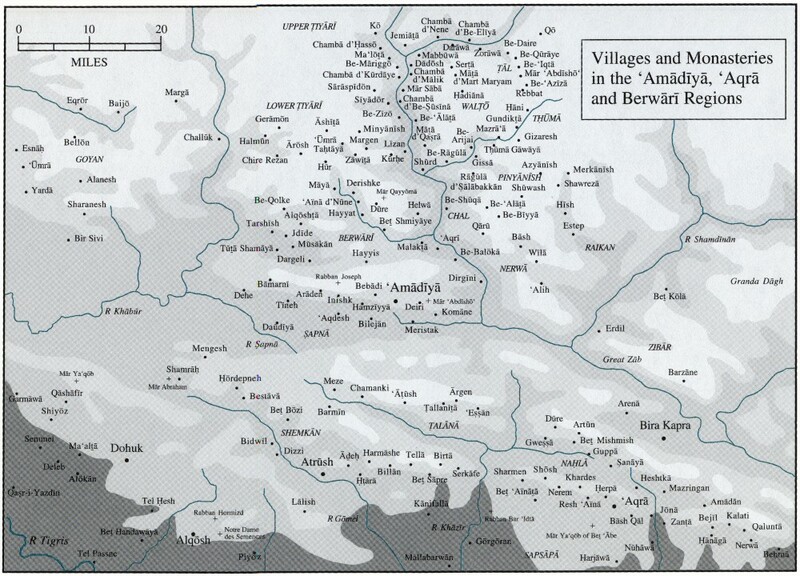 Pogroms quickly reached the neighboring cities of Simele, Shiyooz and Zawitha Here literally all shops belonging to the Assyrians and Yezids were burnt. The hostile attitude to non-Muslim population rose in the province of Dohuk where, in Nohadra, the building of the Assyrian cultural centre was almost completely destroyed including attacks on few Churches. We are assured that the International Political Organizations should not be indifferent to the repetition of genocide of the peoples having exposed to extermination in the territory of Turkey at the beginning of the 20th century, and being exposed to genocide in the territory of Iraq at present, at the beginning of the 21st century. The terror continuing the policy of misanthropic genocide and ethnic cleansing of Armenians, Assyrians, Greeks and Yezids, established by the Ottoman authorities continues now, and inactivity of the International Community can be considered as a tacit consent with these events. The present events show again that the absence of timely recognition and condemnation of the Christian peoples’ Genocide in Turkey, carried out about 100 years ago by the Turkish authorities and Kurdish gangs, indulges new such crimes. As practice has shown that in modern Iraq those who are guilty of purposeful destruction of Assyrians, Armenians and Yezids, as a rule avoid punishment, we consider it necessary to urge openly the federal and regional government of this country to begin impartial investigation of December’s pogroms and to punish their organizers and executors, as well as all those people in freedom guilty of other numerous crimes against ethnic and confessional minorities of Iraq! To provide protection to Christian population of Iraq which possibly if to create the Assyria Federal Region in North of Iraq according to the fixed right of indigenous population in the Constitution of Iraq. We hope that the World Organizations will not be limited to half measures because your actions can be considered as deliberate delay of solving the situation in order to give the Kurdish and Arab islamites the chance to clean the territory from the non-Muslim autochthons of Iraq. by Assyrian Organizations in Armenia and Europe. December 22, 2011. The information of the local Assyrian Community representatives about the lost control situation wa confirmed by official people, including the head of Kurdish regional autonomy, Mr Massoud Barzani. Unfortunately, the vacuum of safety extended to nearby areas of the Assyrian Christians. 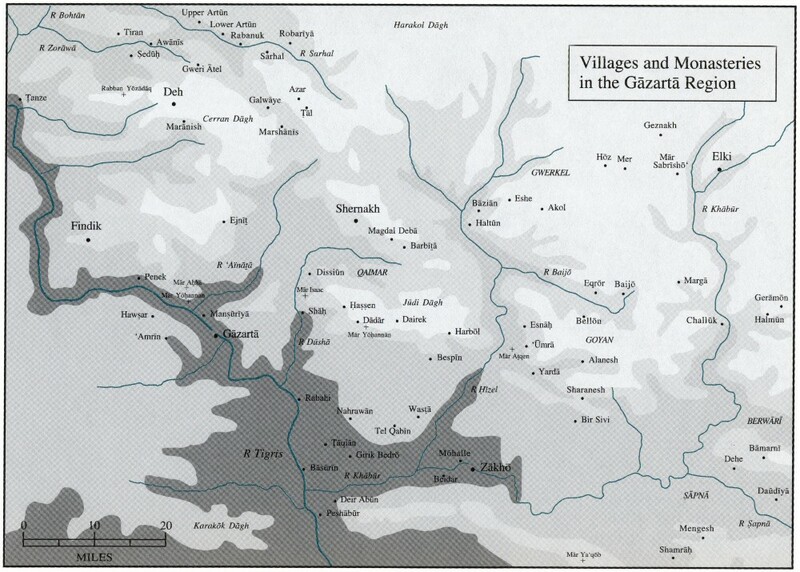 Pogroms quickly reached the neighboring cities of Simele, Shiyooz and Zawitha Here literally all shops belonging to the Assyrians and Yezids were burnt. The hostile attitude to non-Muslim population rose in the province of Dohuk where, in Nohadra, the building of the Assyrian cultural centre was almost completely destroyed including attacks on few Churches. We are assured that the politicians of a country, the people of which were exposed to attacks time and again, cannot be indifferent to the destiny of the peoples being exposed to genocide in the territory of Iraq in the 21st century. The peoples who have suffered total destruction in the territory of Ottoman and Kemalist Turkey, cannot but regard similar events as terror continuing the policy of misanthropic genocide and ethnic cleansing of Armenians, Assyrians, Greeks and Yezids, established by the Ottoman authorities. The present events show again that the absence of timely recognition and condemnation of the Christian peoples' Genocide in Turkey, carried out about 100 years ago by the Turkish authorities and Kurdish gangs, indulges new such crimes. As practice has shown that in modern Iraq those who are guilty of purposeful destruction of Assyrians, Armenians and Yezids, as a rule avoid punishment, we consider it necessary to urge openly the federal and regional government of this country to begin impartial investigation of December's pogroms and to punish their organizers and executors, as well as all those people in freedom guilty of other numerous crimes against ethnic and confessional minorities of Iraq!  To put forward the question for consideration of General Assembly of the United Nations.